The Central PA Gathering of Fiber and Needlework Guilds in Harrisburg, PA was quite an event with 14 participating guilds (see http://www.gatheringofguilds.com/). It was such an interesting variety of crafts. There were talks going on all day and workshops offered. I had the pleasure of meeting a couple of ANG members, Maddy who taught the ornament class and Carol from the Apple Needlepointers Chapter of ANG. It was interesting to participate in a class for people who just want to try needlepoint in a brief 1&1/2 hour class. She did a nice simple project that worked up quickly although it couldn’t be done in the short time we had. But, everyone was far enough along to take it with us and finish at home (seen below). I went rogue though and padded the area under the brown basket! Actually, that was begun by accident once I exceeded the stitch area making it uniquely my own. 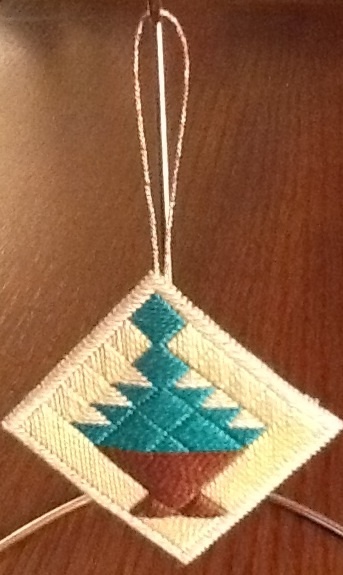 And, I added a reinforcing Nun’s finishing stitch (learned from the Ornament Quartet piece) before adding the outside border. There was no way I was getting out the iron to use the backing she provided so I used felt with an adhesive side. Done! I also had a nice chat with Carol at their table and look forward to seeing her and hopefully a couple of more members again for an upcoming September class (subject of a future blog). Big surprise – I found a book that for $1 I couldn’t pass up on 4-way Bargello (like the last bookend I finished). 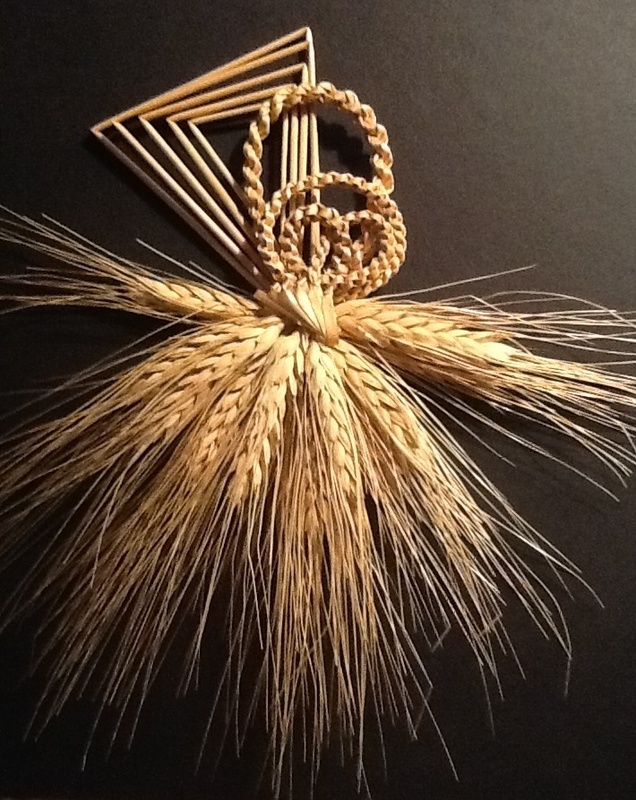 I was particularly interested in the straw artist, Linda Beiler (www.wheatweavingand straw art.com). Her work is just beautiful. Her 1-page bio that she hands out with each piece of her work describes the history of the art form, pays homage to the woman who introduced her to the craft, and shares that she has published a book on the topic. There is an international Wheat Weavers Association and she is a member of several state and local guilds/councils of arts/crafts.